Resource-centred Discussion (RCD) refers to a discussion in which the topic is an artefact or set of artefacts. The artefacts will vary between disciplines, but could include works of art, poems, case studies, business reports, manufactured goods, photographs, etc. The purpose of the approach is to use objects and artefacts to stimulate the students’ thinking and provide an opportunity for them to apply their theoretical knowledge to tangible items. As a discussion, it helps the students develop communication and reasoning skills, and helps them gain confidence and experience in analysing and interpreting artefacts that represent the kind of outputs that they are likely to produce in the future. While it shares some elements of other teaching approaches such as Debate and Critiquing, RCD is generally more collaborative. In contrast to debate, which is often an attempt to create greater understanding through the partisan defence of conflicting viewpoints, RCD is more expansive and seeks to use the resource(s) to collaboratively explore the wider context to which the artefact belongs. Unlike critiquing, which is the analysis of an artefact in order to understand the process behind its creation and identify aspects that work well or could be altered, RCD is less about formal analysis of the artefact and more about using the artefact as a conduit through which the students can share their ideas. From this discussion the students will create new knowledge and understanding by drawing upon their learning and past experience. Resource-centred discussion is a versatile teaching approach that can be used in most disciplines and teaching environments. In addition to the students who are to take part in the discussion, RCD requires, at a minimum, two things: the resource(s), and a question. This question is used to initiate, and provide direction to, the discussion. 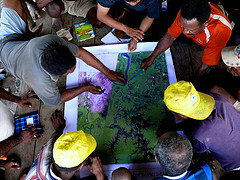 For example, the people in the photograph to the right (“Panel Discussion”) may have been given a question to discuss such as “Do the broader benefits from building large-scale solar energy plants outweigh any localised problems that they might cause?”, and the can use the solar panel and landscape as resources to inform their discussion. The approach can also be used as a multi-disciplinary activity, bringing together students from varied disciplines to share their knowledge and experience in order to provide an answer to the questions. 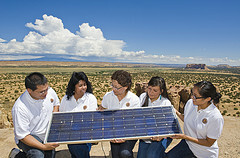 Using the solar panel example from above, the discussion could include engineering, economics, environmental science, and geography students all of whom would have valuable insights that would help inform their final answer. This would give students valuable experience of communicating information from the own discipline in such a way that it can be understood by people from other backgrounds. While the discussion stems from the need to respond to a specific question, the main value of the approach is often in the process rather than the answer the students produce. The discussion should stimulate the students to think more deeply about the topic and gain new perspectives and this can be encouraged by using a controversial or provocative question or resource. However, if using this method to stimulate discussion, it is important to monitor the discussion to ensure that it does not become hostile or confrontational. The approach works well as a traditional group exercise where the students are all gathered in the same room at the same time. However, technology allows the discussion to include people who aren’t in the room or aren’t all available at a specific time. Tools such as Blackboard Collaborate, which includes a whiteboard feature that students can use for making notes on a resource such as a document, photograph or slide, or Google Hangouts enable live discussions to take place over the internet with the option to record the session for future use. Discussion boards, on the other hand, let students contribute to an ongoing discussion when it suits them. They allow students to make more considered contributions because they can take their time in coming up with their responses, and the entire discussion is recorded for future reference. Another opportunity that technology provides is the ability to make use of new types of artefact. Virtual artefacts, such as images and recordings, allow students to easily investigate and analyse specific parts of the resource, both as a group and individually. Technology also provides opportunities for students to interact with resources, for example, students could interact with simulation mannequins and base their discussion around the results or use online maps such as Google Maps and Google Earth to explore geography and build environment. Interactive resources can help provide greater context and lead to a more informed discussion, for example, by using the ‘street view’ features of Google Art Project, students can see how artworks are positioned relative to each other in a gallery instead of just looking at copies of the actual pieces of work. This would enable students to discuss the effect of other artworks in a viewer’s peripheral vision on their appreciation of a particular work. Tablet computers, such as iPads, Android tabs, etc., are excellent tools for supporting these types of interactions because they are powerful, the touch interface is immersive and they can be easily passed around a group. A technology that is likely to grow to be very useful in supporting RCD in the next few years is 3D printing, which is similar to normal printing except that it uses plastic to build three dimensional objects rather than inks on flat pieces of paper. 3D printing enables the creation of resources that were not possible using traditional methods, meaning that new, interesting resources can be created to form the basis of discussion by students. Having a physical resource, rather than a two dimensional image or written description, also means that students can use their sense of touch as well as sight to help inform the discussion. 3D printing is a technology that is currently just entering the mainstream but it has already been used in many projects. For example, 3D printed dinosaur bones have been used to assist students in thinking like palaeontologists, a 3D version of Van Gogh’s Sunflowers painting encourages a new perspective when thinking about his work, and abstract structures and shapes created mathematically can be explored physically. Where in the course/module would this approach work best? What resources would stimulate the discussion? Would the discussion be best ‘live’ or should students be able to contribute when they are able? Are there opportunities for multi-disciplinary discussions? How much technology should be involved? Which tools are most suited? What support would be needed? Are the students (and other tutors) ready for this? Having thought about these questions, you should have worked out whether RCD is an approach that makes sense in your context and have some ideas about how to introduce it. If you are still unsure, you could try a small exercise in a single lecture or seminar and see how the students respond.